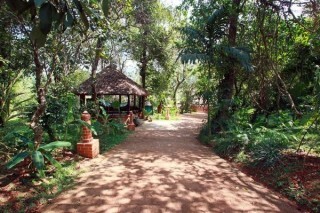 Located in the heart of Udupi District in Mangalore, this cottage accommodation will take you on a nature trip. 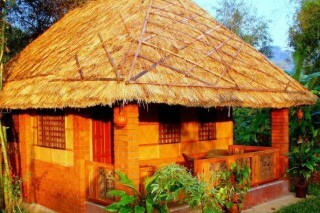 This thatched roof cottage with brick pillars and an earthen look is furnished to accommodate two people comfortably. Well-appointed with a bamboo double-bed and cushioned cane arm chairs, this cottage provides a calm and soothing atmosphere for guests. 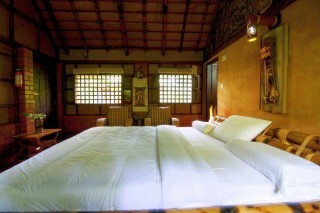 The walls of the cottage have a clay texture and the many windows allow ample natural light into the cottage. 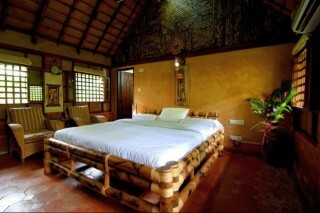 The interior walls of the cottage have a brick design and the ceiling is panelled with bamboo. 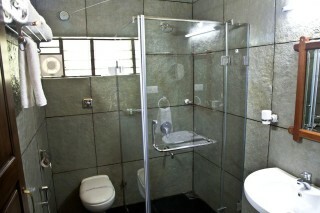 The bathroom of the accommodation is modern and well-appointed with modern fittings. 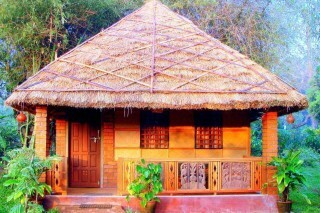 Our bamboo cottages are completely built using the natural materials like bamboo rafter, mud walls, matted cane ceiling; with arecanut palm panels and ethnic building techniques.